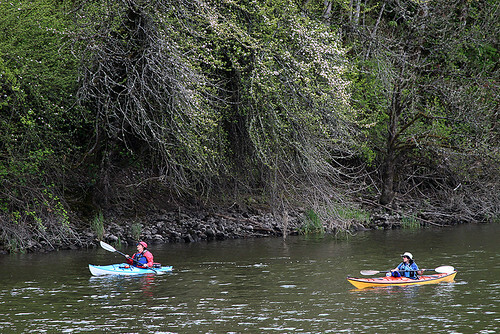 The Paddling Poet workshop on Lake River in Ridgefield went beautifully last night. The temperature was just right, there was a little wind, clear skies, and a variety of birds and some other critters.We paddled, talked about writing, I read a cinquain poem and we talked about structures of poetry. And paddled - with our eyes and ears open, open to what Lake River offered us as fuel for our creativity. Good company, good setting, physical and mental and spiritual all at the same time. With all of that in mind, today's Razor's Edge is about water and cinquain poetry. I'll give you a definition of this form and, as an example, will use the cinquain I wrote last night in response to being on the water. In any order you want, watch the River Song flute video, the kayaking video, and look at the picture of the Blue Heron. Write a cinquain for the river object you selected. Ridgefield boat launch : Columbia Trail Org. I LOVE the Paddling and Poetry workshop. I hope this takes off and that there are many more in the future.